As reported in today’s Daily Mirror, the Conservative government has admitted that it has no concrete evidence to prove that so-called ‘benefit tourism’ exists. And yet, Prime Minister David Cameron has vowed to ‘crack down’ on benefit tourism to reduce the numbers of EU migrants coming to Britain. Mr Cameron wants EU migrants in Britain to wait four years before they are eligible to claim benefits – longer than British workers currently have to wait. His proposal would break an EU foundation principle: that when EU citizens move to another EU county for work, they will enjoy the same benefits as the natives of the host country. In a Parliamentary question, former Labour leader, Neil Kinnock, requested “all factual evidence” held by the Department for Work and Pensions that proved migrants were lured to Britain because of benefits. The response provided by the DWP was analysed by expert Jonathan Portes, a Senior Fellow at the National Institute of Economic and Social Research. As I have reported on numerous occasions, no evidence has emerged of any serious problem of so-called ‘benefit tourism’. In fact, even prior to Lord Kinnock’s intervention, on three occasions the European Commission asked the British government for evidence of ‘benefit tourism’ – and three times the government wasn’t able to provide any. The evidence is that welfare systems don’t generally drive immigration, according to Mr Portes. Nobody from the rest of Europe comes to Britain to claim benefits; they come here for employment. Britain currently has more job vacancies than can be filled by the native workforce. That, in a nutshell, is why we need migrants. 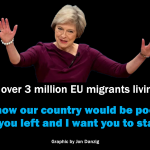 The country has a chronic skills shortage and without migrants helping to fill that gap, Britain – and Britons – would be poorer. According to Bank of England boss, Mark Carney (himself a foreign worker), Britain has one of the strongest jobs market in the world, and it’s mostly British workers who are taking up the jobs. But foreign workers are also needed, he said, and they are contributing to Britain’s increase in productivity. 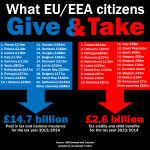 A major study by University College London showed that EU migrants coming to Britain in the last decade made a net contribution to the Treasury of around £20 billion, during a time when British natives were taking out more than they were putting in. So this is the question: why is the Conservative government concentrated on fixing problems that don’t exist (e.g. ‘benefit tourism’, ‘too many migrants’) and ignoring problems that do exist (e.g. poor people relying on food banks; flood victims not getting sufficient support)? This entry was posted in Current Affairs, Democracy & Citizenship, Economics & Trade, Global & International, Law & Justice, Politics & Public Policy, The EU and tagged benefit tourism, benefits, Daily Mirror, David Cameron, EU migrants, European Union, free movement, Neil Kinnock, skills shortage. Bookmark the permalink. 2 Responses to Benefit tourism: why ‘fix’ a non-existent problem? I imagine that the reason Jon is that he is trŷing to placate the more than 70% of the electorate that wish to see the immigration levels cut and persuade them that cutting in work benefits will affect those numbers. Or the 50 % who wish to see those numbers cut dramatically. Where we agree is that doing so is unlikely to make much difference to the numbers. 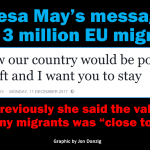 Frankly the immigration associated with EU membership is the least of my problems with the EU, immigration from backward theologically based areas of the world causes far more concern. Care to reconsider your open border viewpoint after the New Year festivities in Cologne Jon? Or perhaps you have a dead kid on the beach photo to justify it. The women of Cologne would love to hear from you. What happened in Cologne and some other European cities was totally unacceptable, and cannot be excused or condoned. However, the vast majority of refugees are law-abiding citizens fleeing from persecution and are not criminals. Out of a million asylum seekers who have recently moved to Germany, those 18 or so asylum seekers who allegedly caused trouble in Cologne represent an extremely small proportion. The vast majority of migrants in the UK are hard-working, tax-paying citizens who are making a significant net contribution to the UK treasury and to our economy. The fact is that we need them. Britain currently has more job vacancies than can be filled by the native workforce.